Mon, March 11, 2019 6:00 P.M. 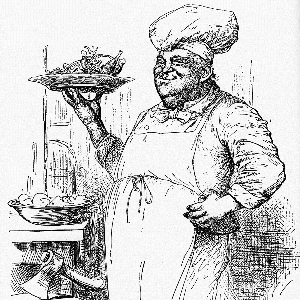 In the mid-19th century, Philadelphia invited seasoned New York culinarians to an extravagant dinner in response to a cooking challenge. Philadelphia chef James W. Parkinson rose to the challenge and created a seventeen-course meal known as the “Thousand Dollar Dinner.” Sourcing difficult and luxurious ingredients such as out-of-season fruits and vegetables, salmon, and rare wines and liquors; New Yorkers declared Philadelphia the winner in the culinary challenge. Author Becky Libourel Diamond presents the entire dinner in her book The Thousand Dollar Dinner: America’s First Great Cookery Challenge. Come enjoy some of the dishes, including turtle soup, prepared at the "Thousand Dollar Dinner" with chef Adam Diltz. Learn about the research process for writing the book and how the dinner became a pivotal point in Philadelphia’s culinary history. A book signing will follow. Cookbooks will be available for purchase. Tickets are $25 without book, $45 with book included and available on Eventbrite. This program is inspired by the exhibition, Philadelphia: The Changing City, on view now in our William B. Dietrich Gallery from October 10, 2018 through April 13, 2019. This class is age 21+. Becky Libourel Diamond is a food writer and research historian. Her second book, The Thousand Dollar Dinner, tells the unique story of a nineteenth century culinary challenge between Philadelphia restaurateur James Parkinson and the Delmonico family of New York. She is also the author of Mrs Goodfellow: The Story of America's First Cooking School. She is currently working on a book about The Jayne Building, America’s first skyscraper, and is partnering with fellow epicurean Max Tucci to write the story of Oscar’s Delmonico restaurant. She lives in Yardley, PA.
Adam Diltz is a chef in the Philadelphia region. Diltz became interested in cooking at very young age by helping his great-grandparents on their farm. After finishing culinary school at the Pennsylvania College of Technology, Diltz went on to work for three James Beard Award winning chefs (Barbara Lynch at No. 9 Park in Boston, Jean Joho at Everest in Chicago, and Joseph Lenn at Blackberry Farm in Tennessee). He has worked for numerous Philadelphia restaurants including the Yardley Inn, Farmicia, and Johnny Brenda’s. He is currently in the process of opening his very own restaurant Elwood that is slated to open this spring. Elwood has been a life-long dream for Diltz. It celebrates the rich culinary history of Philadelphia and the surrounding Mid-Atlantic region.